Nothing is more comforting than cinnamon, sugar and warm bread. So now that it's the Mardi Gras time of year, I thought I'd make my version of King Cake! 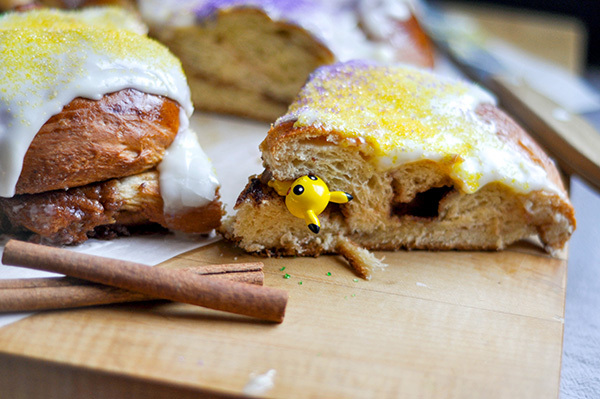 Complete with a baby toy...it may not be a baby Jesus, but since I was making a Milk Bread King Cake, I figured a baby Pikachu may be appropriate. If not I apologize, but It was pretty darn cute. Maybe this should be called the King of Milk bread instead of Milk Bread King Cake, because this makes a pretty massive loaf! Great to share to a group of friends, but man it was daunting to finish in my house. This starts out with the Woks of Life milk bread recipe that I so adore. I've tweaked it a teeny bit, with less sugar and added spices. It's the best and easiest recipe for milk bread around and anytime I start to even think about making a starter dough for milk bread, the lazy side of me tends to go with this version. All the bread ingredients go into the stand mixer and gets kneaded with a bread hook for 15 minutes. Yes it seems like a long time, but you need to work that gluten enough to achieve the windowpane in your dough, where you can stretch it out and the dough will get thin enough to see light through it. Once this has been achieved, cover and allow the dough to rise for an hour in a warm area. No need for flour on your bench as this dough is tacky, but doesn't stick to the surface. (Also making it the best dough to work with!) Roll the dough out into a large rectangle, about a quarter inch thick. Spread the dough with the softened butter and sprinkle on the cinnamon sugar. Press the filling down into the dough and fold the rectangle in half lengthwise. This is where it gets a bit tricky, especially when you're kids are screaming in the other room and you lose a bit of your concentration. Cut this folded rectangle into 3 equal sized strips, lengthwise. I say equal because that is not what I did. Screaming at your kids to quiet down and cutting dough do not mix! So again, try your best to cut them into equal strips. Press the top inch of these strips together and braid braid them together, careful not to spill the filling. Press the end together to seal and bring this sealed end and the top together to form a large braided oval. Place this on a parchment lined baking sheet. Cover and allow to rest for 30-40 minutes. Pre heat your oven to 350F. Brush with Egg wash and bale for 25-30 minutes. As it cools, make the icing by whisking together the softened cream cheese, sour cream and powdered sugar together. Spoon the glaze on the cooled cake and sprinkle with colored sanding sugar. This cake is essentially a large braided cinnamon twist, and it is so, so good. Nothing says Mardi Gra more that a king cake. And this milk bread version creates a fluffy, warm, gooey cake filled with cinnamon sugar and topped with that tangy sweet icing. It's heaven on a plate. 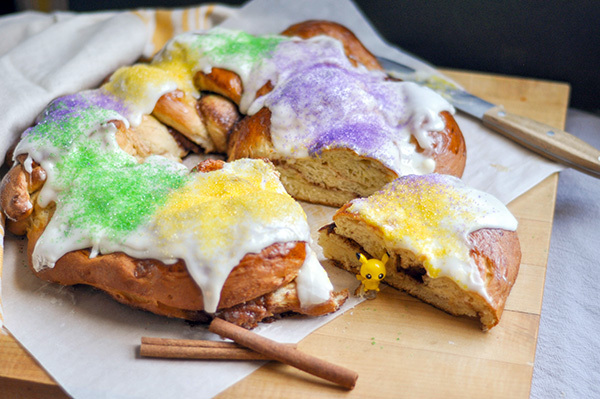 Try this take on the King Cake this year and let me know what you think! Also follow me in instagram for more on my weekend bakes! Make the bread by adding all the ingredients into the bowl of a stand mixer. With the dough hook attachment, mix the dough till combined. Then knead the dough (on a Kitchenaid I like to move this up to level 2) for 15 minutes. Once dough is smooth, and you can see through it with the windowpane test, cover and allow to proof for 1 hour. After it has risen to about 1 1/2 times its size, punch down the dough and turn it out onto a work surface. There's no need for bench flour as this dough is slightly tacky but does not stick. Roll the dough out to a large rectangle about 1/4 inch thick. Spread the softened butter all across the top and sprinkle on the cinnamon and sugar. Press in the filling and carefully fold the rectangle in half. Start about an inch from the top and slice the rectangle into three equal strips. Braid the strips together. It may be a bit messy and filling will spill out but its ok. Braid on! Pinch the ends of the braid and bring the two ends together to for a large oval shape. Pinch the ends together and place on a parchment lined baking sheet. Allow to rise for 40 minutes. Pre heat the oven to 350F. Make an egg wash with one egg and 2 tbsp of water. Brush the top of the risen bread with the egg wash and bake for 25- 30 minutes. Allow to cool and make the glaze. Whisk together the softened cream cheese with the sour cream. Mix in the powdered sugar until smooth. Pour the icing on and top with colored sanding sugar. Slice and eat!